The hue and cry over the "ecological tragedy" following the oil spill off Shetland Islands is dying a natural death, and even environmentalists are admitting nature is not all that vulnerable. WEEKS after the Liberian-registered oil tanker, Braer, was wrecked by hurricane winds off the coast of Britain's Shetland Islands, scientists and environmentalists who had predicted a wildlife disaster feel the environment's resilience may have been underestimated. The Braer spilled its entire load of 26 million gallons of oil, more than double the 11 million gallons leaked off Alaska from the ill-fated Exxon Valdez in March 1989. The Braer's oil has spread for more than 25 miles along the Shetlands coast and has also been sprayed by gusting winds on thousands of acres of pastureland. The affected area is one of the richest breeding grounds for bird and marine life in Europe and also at risk is the L35-million, salmon-farming industry. However, heavy rains and wind are already helping break up the oil slick. Britain's Department of Transport estimated 40 per cent of the spill would evaporate, 20-30 per cent would disperse in the choppy seas, leaving about 30 per cent to be cleaned up. The relatively light Norwegian crude is being rapidly broken down by waves and bacteria and environmentalists are optimistic long-term effects of the spill may not be as serious as originally feared. "The Exxon Valdez shows nature is a great recoverer," said Peter Taylor of the Oil Pollution Research Unit, an environmental consultancy firm. A spokesperson for the British Marine Pollution Control Unit, which is in charge of the clean-up, thinks it is "highly unlikely that much oil has settled on the sea bed". Insurance cover The Braer's foundering has also aroused speculation about who would ultimately pick up the L46 million tab in clean-up costs and damages. International conventions stipulate the polluter must pay. However, pending final settlements, the European Commission has made L 560,000 available in emergency aid and promised L 262,000 more to repair ecological damage. The Braer has an insurance cover of upto L466.7 million, disclosed Jean Gaulin, chief executive of Ultramar, the North American oil company that chartered the tanker. But, under international conventions in 1969 and 1971, clean-up funds and compensation to Shetland islanders will be limited to a total of L 55.3 million. In addition, the London-based international fund for compensation, financed by levies on oil companies, will pay L49.3 million for environmental liabilities. Insurance payments for pollution-related costs can exceed convention limits, but the claiments would have to prove the tanker's owners, Arild Bergvall and Michael Hudner, were guilty of gross negligence. This would be complicated because the Braer was registered in Liberia, a "flag-of-convenience" country that only casually enforces international safety and pollution-control standards. One-third of the world's biggest oil-spills between 1967 and 1984 involved flag-of-convenience ships, said a representative of Numast, a British maritime union. A major worry now for Shetlanders and environmental groups is the chemical dispersants being arial-sprayed on the oil slick. "Some of these dispersants are toxic and we are concerned about that, "said John Goodlad, head of the Shetland Fishermen's Association. 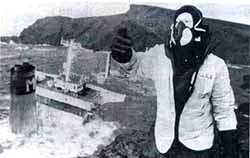 His concern was echoed by James Moncrieff, chief executive of the Shetland Farmers Association, who explained, "The mixture of oil and dispersant creates an emulsion that goes right down through the water and this may cause more damage than if it had been left alone." The British policy to rely on chemical dispersants contrasts with other countries that prefer to use mechanical equipment such as floating booms to contain the slick, skim it off the sea surface and pump it into clean-up vessels. However, the British Marine Pollution Control Unit argues that rough seas off the British Isles make it difficult to use mechanical methods, and the dispersants being used are less toxic. Following the Exxon Valdez disaster, the US passed the 1990 Oil Pollution Act, setting the toughest standards yet. The International Maritime Organisation is pushing for international regulations on the same lines, including requiring new ships to be double-hulled for extra strength and obliging shipowners to put safety on par with profits.